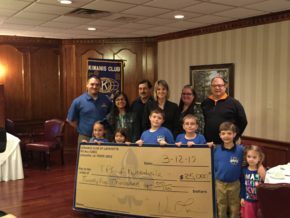 Today, the Kiwanis Club of Lafayette presented a check for $25,000 towards a much-needed new playground structure at Woodvale Elementary. Present to accept the gift were Ms. Monique Vidos, Principal, representatives of the Woodvale P.T.C., including P.T.C. President Brandi Comeaux, as well as some Woodvale students. The P.T.C. 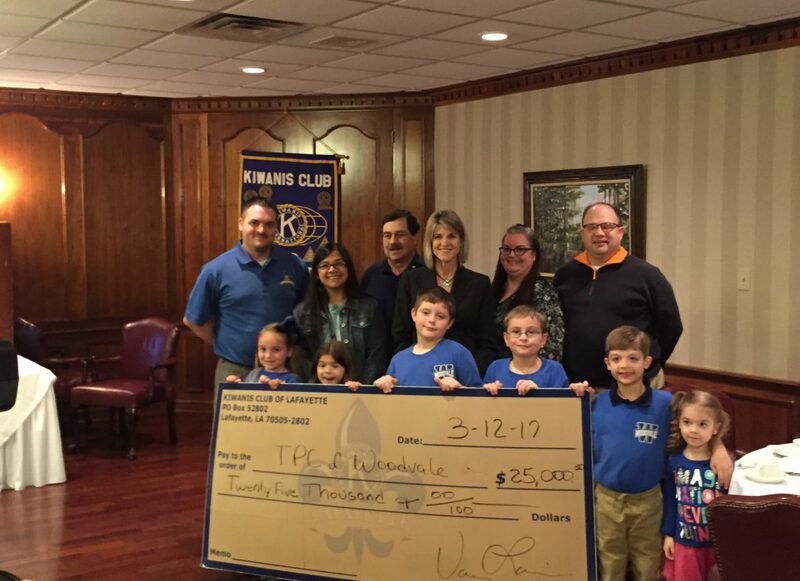 raised over $35,000 over the past five years to build momentum for the project and the Kiwanis of Lafayette is pleased to assist them in making the project a reality. The project will be built upon the conclusion of the current school year and will be ready for use at the start of the 2017-18 school year. In addition, because of Kiwanis’ involvement, the project's contractor Kincade Recreation (who previously partnered with our club to build Parc Independence), has agreed to donate four benches with Kiwanis logos for the project! The playground equipment will be used by students, as well as others who participate in after school programs and activities.